Earlier today, Robert Mueller revealed that he was on the move when he had Michael Cohen go into court and expose that Donald Trump was trying to build Trump Tower Moscow during the election. Then, in what may or may not be a coincidence, authorities raided the headquarters of Deutsche Bank, which is Trump’s favorite money laundering bank. Now there’s another major Trump-related development. The Feds have invaded the office of Chicago Alderman Edward Burke, ordered everyone out, and placed brown paper over the doors, according to a tweet from Chicago Sun-Times City Hall reporter Fran Spielman. Here’s the thing about Burke. He’s not just an Alderman for the city of Chicago. He also runs a law firm that did tax work for Donald Trump for twelve years, only to sever the relationship a few months ago. So what’s going on here? The raid strongly suggests that Burke is being criminally investigated by the Feds. There are any number of potential reason for such an investigation, ranging from Burke’s political activities, to his various law firm clients. 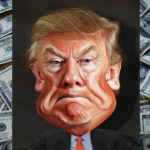 But when you factor in that Burke did tax work for Trump, and he’s being raided on the same day that Trump’s money guy Micheal Cohen is incriminating Trump, and on the same day Trump’s favorite money laundering bank is being raided for money laundering, is this all one big coincidence?